As part of The Anne Boleyn Files’s To Die For competion, I have decided to write about a Tudor era figure I find quite interesting to read and learn about: Mary Boleyn. Not only was she our heroine’s elder sister, but was also the king’s mistress and supposedly bore him at least one child. 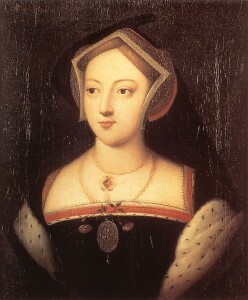 Mary Boleyn was most likely the eldest child of Thomas and Elizabeth Boleyn, born circa 1499/1500. Mary was raised at Hever Castle in Kent by a french governess along with her siblings, Anne and George. It was here that she received an education above standard for women at the time, as well as the feminine tasks of sewing, embroidery, manners, and dancing. When Mary was around 13 or 14, she accompanied the Princess Mary to France as a maid of honor for the duration of the princess’s marriage to King Louis XII. After the aging king had passed away, Mary remained in France and joined the court of the new king, Francois. Mary was soon joined by her father and her sister, Anne, who had previously been in the Netherlands. During this time it is believed that Mary began several affairs, whose list of men allegedly included the king of France himself. After becoming Francois’s “English Mare”, Mary returned to England to become a lady in waiting for Queen Catherine in 1519. Soon after her arrival, Mary was married to courtier named William Carey. The guest list to this event even included the King, Henry VIII. Some time after this, although the timing is unknown, Mary and Henry VIII began an affair; an affair believed to have lasted as long as five years. In the span of their affair, Mary bore at least one child, who was said to be the child of the king. There are conflicting accounts about the subject, but Henry never acknowledged the child as his own as he did Bessie Blount’s son. Shortly before Mary’s second child was to be born, the affair between her and the king ended. Whether her son Henry or daughter Katherine was born first has been debated but there were rumors from the beginning that one or both were the king’s; Henry Carey was even considered to look like Henry VIII. Shortly after the ended liaison, Henry began to show interest in another woman, one who was very close to Mary; it was her own sister, Anne. After refusing to become his mistress as her sister did, Henry was determined to marry Anne and divorce Catherine around the year 1527. Due to the closeness of kin to Henry’s former mistress, this needed a dispensation from the church. In 1528, an outbreak of the sweating sickness plagued England, and in its wake left Mary a widow. After her husband’s death, Mary was left with hefty debts; her sister Anne was given wardship over her young son to help provide adequate education to the fatherless youth. Anne also provided her sister with an annual income of £100. Years pass and the king and his wife-to-be travel to Calais with Mary in tow in 1532 as a companion. In 1533, Anne marries Henry before giving birth to her daughter the future Elizabeth I in September. This same year, Mary privately married a commoner named William Stafford, much to Anne’s and the family’s ire. For this secret marriage, Mary was banished from court and disowned by her family. Because Mary had married a commoner for love, money for her family was tight; it was so critical that Mary was forced to beg the king and queen through Cromwell for assistance. When the king paid her no heed, she turned to her male relatives, but to no avail. Eventually her sister complied and sent Mary money along with a golden cup. Between 1534 to 1536, there is almost no mention of Mary and her husband. During this time, Mary remained persona non grata and stayed with Stafford in seclusion at Rochford Hall. In 1536, her brother George and sister were executed for the crime of treason and within three years, Mary’s parents were both deceased. Mary had inherited land in Essex and lived there in placid seclusion until her death on July 19, 1543. I find Mary Boleyn to be a very mysterious persona. Her sister was the queen of England, yet still so little is known about her, especially in her later life. There are so many questions and so little information; we know she was pretty, but is there any portraits confirmed to be Mary? Was she meek and sweet? Or did she have a temper similar to her sister? This woman is veiled in mystery and enveloped in scandal; it is appealing. A woman so appealing that two kings are said to have kept her as mistress, a woman whose offspring were quite involved in the life of their cousin, Elizabeth I, and a woman surrounded by tribulation who managed to perservere.